Bramata is a term used in Graubünden to refer to coarsely ground cornmeal. It can be used to make the time consuming, but simultaneously fluffy and creamy, polenta of your dreams. It can also be used for other dishes, like these tender, raisin-studded polenta dumplings. 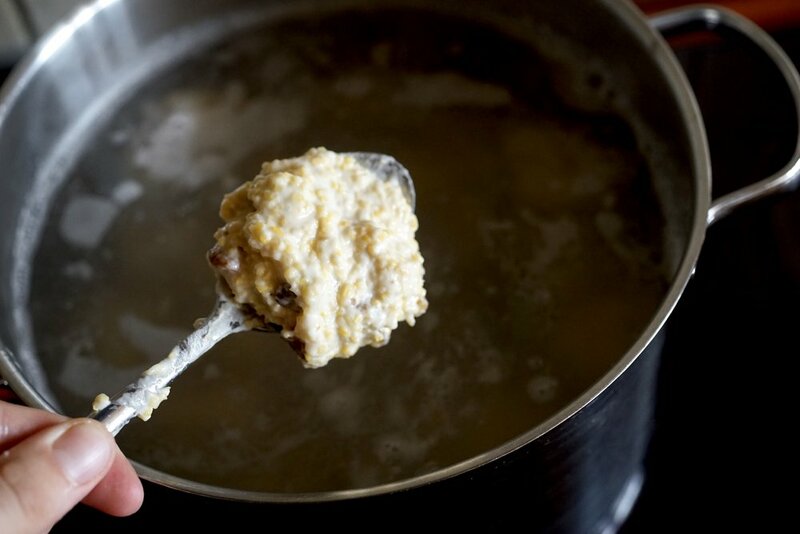 Warm the milk until simmering, then pour it over the cornmeal. Let this sit for an hour. Add the flour, salt, and raisins, and stir to form a dough. Heat a big pot of salted water to just simmering. Using your hands or a spoon, make small dumplings. If the dough is a little dry, add a splash more milk, or if it is too sticky, add a little more flour. Add these dumplings to the pot and let them simmer for about 45 minutes. Scoop them out, then top with lots of grated cheese. Soak your raisins in hot black tea first, to plump them up. Once the dumplings are in the simmering water, give them a gentle swirl with a spoon to make sure they don't stick together. If you wish, add some melted butter to the finished product.